﻿﻿ 1959-2018 PDS Lincoln Cent Starter Set. for sale. 1959-2018 PDS Lincoln Cent Starter Set. Gem BU for sale. 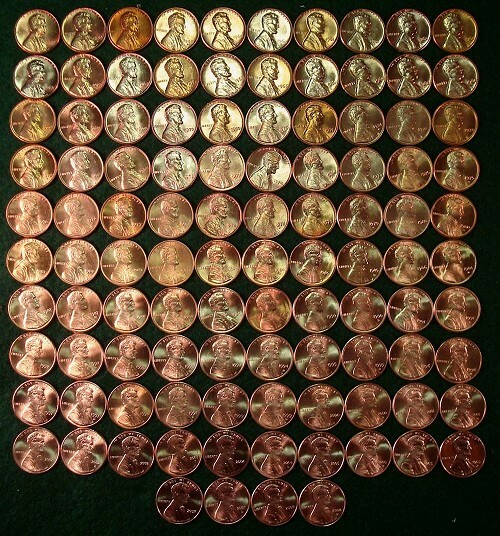 1959-2018 LINCOLN MEMORIAL CENT SET 138 COINS: This set of Lincoln Memorial cents includes all regular mint issue P-D-S cents in brilliant red uncirculated. Total of 138 coins from 1959 to 2018 (including the 8 2009 P&D Birth and Childhood; Formative Years; Professional Life & Presidency cents...and also the 2010, 2011, 2012, 2013, and 2014 P&D Shield cents). This does include the 1960 varietes includeing the 1960 P&D small date and the 1960 P&D large date. Also included are the 7 varieties of 1982 coins. The set comes in 2 tubes. They are all in order, ready to place in your favorite album. This set does not include double dies, 1970 S small date, error coins or proof coins. They have been carefully selected from choice original rolls for overall quality and eye-appeal. Although there may be a few coins that are lightly toned or with a few flyspecks, I have culled out any problem coins. Satisfaction is 100% guaranteed. The picture shows a typical set from the ones that I'll be offering. 1959-2018 PDS Lincoln Cent Starter Set. for sale.